Did you guys know you don’t need Oculus Rift or HTC Vive in order to enjoy fluent virtual reality drone experience? Well, it’s all true. Drone with VR headset is based on a different technology which doesn’t cost nearly as much as one of those 2 VR devices. Plus, it works on its own, meaning you don’t need an expensive PC to run everything. Just think about it this way – you put your VR headset on your head and you immediately see what your drone’s camera sees. Is it magic? No, it’s FPV! First Person View (the mode which works with VR headsets) basically represents live video transmission from your drone’s camera to your VR headset. The result – highly immersive flight experience which puts you straight in the cockpit. You’ll enjoy your flights like never before! If there’s one great thing about Air Hogs DR1 then that’s definitely the flight stability. With 2 adjustable speed settings, this thing packs quite the punch too. Those ducted props look aggressive and they sure can provide good speeds for a brushed micro racer. Considering that, it’s not surprising to see the lack of altitude hold and similar “smart features”. After all, this is an entry-level model made for racing, not exploring or aerial photography. As such, it doesn’t need those software gimmicks – 6-axis gyro stabilization is just enough. The best thing about its camera is not its image quality but its tiltability. It offers a wide range of angles, meaning you can adjust it to suit your driving style. For speed mode 1 leave it just above the horizon. For speed mode 2 though, you’ll want to crank that baby up some more. Last but not least, Air Hogs smartphone app is really neat. It’s nicely polished and even features a video editor where you can insert short animations or a bunch of stickers. Considering the fact this is a FPV drone kit with goggles primarily meant for indoor use (although it flies great outdoors too), I did not expect a whole lot of range from it. It does work via 2.4Ghz connection and can get you around 50 to 70 meters. But, in terms of battery, the folk over at Air Hogs did not do a particularly good job. You see, the battery is unremovable which eliminates the effort of buying extra ones for prolonged flight time. After each flying session, you’ll have to take a 40-minute break to charge it back up. But, considering a full charge gives around 7 minutes of airtime, I’d say Air Hogs DR1 makes it even. Up in the front, you’ll notice a miniature camera. It is tiltable downward or pointing the horizon. Not nearly as tiltable as DR1’s camera. But, it supports HD video transmission via WiFi with just a tiny bit of lag. Considering its WiFi FPV, it’s actually pretty good. Another thing worth mentioning is the packaging. Air Hogs Helix Sentinel comes in a sturdy briefcase that can house all of its accessories. It also sports a carrying handle which makes traveling a piece of cake. 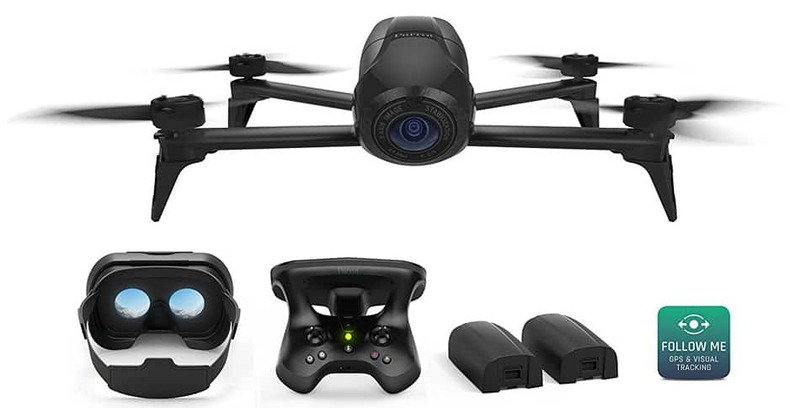 Moving onto the features, I’m sure you’ll agree with me (after reading this section) that this is where this drone with VR camera – Air Hogs Helix Sentinel shines the most. It’s all due to a funky looking module strapped to the bottom of the drone. It sports down facing ultrasonic sensors for altitude hold as well as 4-direction obstacle avoidance sensors. 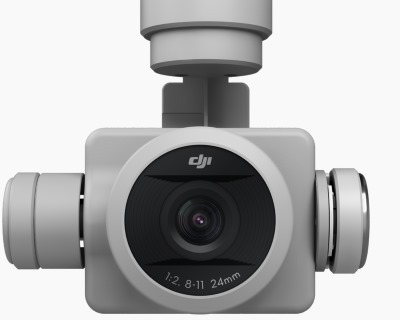 They’re not as precise as the ones you get with, for example, DJI’s flagships, but they do their job quite well… Especially indoor. Anyway, it’s not something we see often with entry-level drones so it’s a big plus nonetheless. Specifications of this cheap virtual reality drone are nothing spectacular though. As a matter of fact, they are roughly the same as those with DR1. You can expect around 70 meters of controlling range. On the other hand, battery duration is slightly better… but only if you take off the foam protection. Without foam protection, you can expect 8 to 10 minutes. With foam protection, you’re looking at 6-7. Not bad either way, don’t you agree? In addition to the drone itself, Parrot Bebop 2 Adventurer package also grants you the SkyController (more about its benefits below), Cockpitglasses and a specialized backpack to fit everything. This will allow you to go on an amazing adventure with your drone and all of its accessories nicely packed in 1 backpack. As for the camera, Parrot Bebop 2 sports an awesome 14MPX built-in sensor. Best of all, it has integrated 3-axis electronic image stabilization which will do wonders for your aerial footage. Don’t forget about its smart features such as altitude hold, GPS reception, and even flight planning. Cockpitglasses offer a great VR experience. But, keep in mind you’ll have to provide your own smartphone for them to work. The lenses are good and the overall build is not too heavy meaning it won’t make your head sore after longer usage periods. 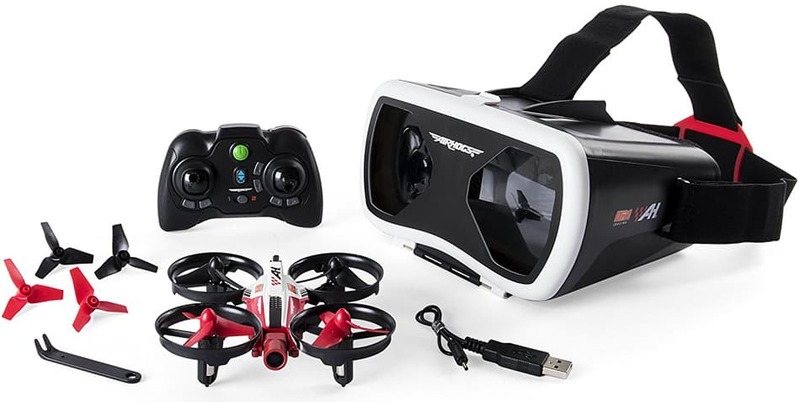 Now we are at the most important part of this FPV drone kit with goggles – its specifications. Considering Parrot Bebop 2 sports a great camera and a fine set of features, it is only logical to see it have excellent specifications as well. Starting off with operating range, that is where SkyController gives its best shot. You see, thanks to its excellent reception, Parrot Bebop 2 can go as far as 2 kilometers with ease. The provided 2700mAh 2S LiPo battery is in charge of providing the entire build with juice. And, quite frankly, it does a great job by delivering roughly 20 to 25 minutes of runtime. Pretty sleek, don’t you agree? We are so close to the top spot on this list of virtual reality drones. But first, we have to go through the runner-up and that would be DJI Mavic Pro. Undoubtedly, we are talking about one of the best drone with VR camera on the market. It pushed the boundaries of aerial photography by providing a state of the art footage quality in a ridiculously small size factor. But, other than that, what else is there to be said about DJI Mavic Pro? Hmm… where should I star?! Perhaps the camera makes a good starting point. You see, DJI Mavic Pro sports a tiny CMOS sensor capable of recording in glorious 4K resolution at 30 frames per second. Lower the resolution to FHD or HD and you’ll enjoy 60FPS and even slow motion at 120. But that’s not even the best part – most smaller aerial photography drones offer only EIS (Parrot Bebop 2 is the perfect example) but this one goes one step further. DJI Mavic Pro has a fully fledged 3-axis gimbal for the ultimate image stability. Talk about perfectionism, huh?! I don’t even have to say a lot about its features. We all know DJI doesn’t take features for granted and implements basically their entire arsenal in every flagship device. The same goes for DJI Mavic Pro which as access to a bunch of autonomous flying options. GPS coverage, altitude hold, waypoints, follow me, obstacle avoidance, and many more… Whatever you might need, I’m sure DJI Mavic Pro can provide! I reckon most of you realize that DJI Mavic Pro has breathtaking specifications too. I mean, anything other than that would be highly surprising considering we’re talking about a high-end drone. Well, there’s no need to worry – DJI Mavic Pro has everything sorted out. Take operating range as the perfect example – it possesses DJI’s OcuSync transmission technology which grants up to 7 kilometers of distance. Furthermore, this birdie packs a might battery which can provide it up to 27 minutes of flight time. Yup, we can all agree that DJI Mavic Pro is a brilliant model… however, if you want a proper VR experience, your best bet is DJI Goggles and they don’t come in the standard package. You can either buy them separately or together in a VR bundle. We’ve reached the best drone with VR headset and it’s none other than DJI Phantom 4 Pro. DJI drones are usually on top of most lists we have here so people think we’re being paid, which is obviously not true. As a matter of fact, we haven’t received a single drone from them yet alone cash or anything like that. So why are their drones on top of our lists? Well, they’re just too good for all other competition… And that’s exactly what you’ll be able to see in the next couple of paragraphs! The first reason is obviously its superb camera. DJI Phantom 4 Pro sports a praiseworthy 20MPX 1-inch sensor that can capture breathtaking aerial footage. Needless to say, it is mounted on a 3-axis gimbal. So, as far as image/video quality and smoothness are concerned, there isn’t a drone on the market that can do it as good as DJI Phantom 4 Pro. Nothing but greatness awaits in the features section as well. DJI Phantom 4 Pro has everything DJI Mavic Pro has to offer… and then some. Its obstacle avoidance system has received quite the upgrade with 5-directional sensors keeping this drone with VR camera from crashes at all costs. Specifications are pretty much the same as those on DJI Mavic Pro. Both of these models use OcuSync so their transmission distance is roughly the same – 7 kilometers in a clear and unobstructed area. Now, even though flight times are said to be the same too, they actually slightly vary. In terms of battery duration, I’ve personally had better experiences with DJI Mavic Pro. It’s nothing major, just a minute or two less coming in from Phantom 4 Pro. So, roughly 25 to 27 minutes in real flying scenarios. Just like DJI Mavic Pro, the standard package of P4Pro does not come with DJI Goggles either. 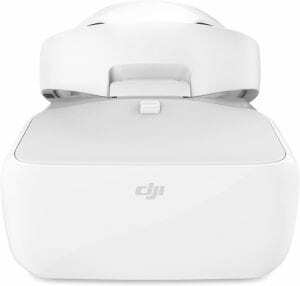 The story continues in the same fashion for both models – you can either purchase DJI Goggles separately or together within a bundle. Which of these virtual reality drones has the best VR headset? VR headsets come in all shapes and sizes. Some of them are WiFi bound while others use the ever so popular 5.8Ghz connection. Either way, what you want is an easy-to-use device which doesn’t require a lot of tampering around with its settings in order to get it working. Of course, image quality is equally as important as that. You want natural colors and good resolution to fully immerse yourself in the VR experience. Last but not least, you’ll want long range video reception and as little latency as possible. So, which drone with VR camera & headset does the best job in terms of these criteria? Well, the most expensive one, obviously. Needless to say, that would be DJI Goggles. However, they don’t come with DJI drones in the standard package which means they don’t provide the best out of the box experience. 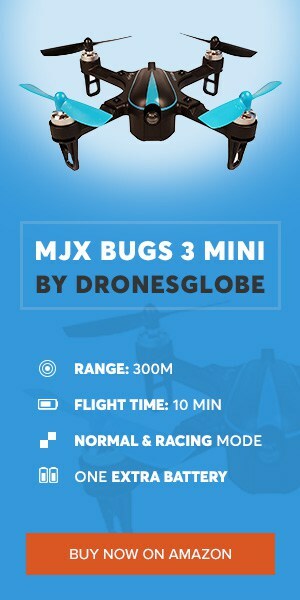 Still, there are several bundles available which include them together with the drone of your choice. These packages provide great value for money and I warmly recommend getting them. You’ll experience VR like never before. Which of these drones has the best camera? Which of these drones has the best out of the box VR experience? Since DJI Goggles are not included in the standard packaging of either P4Pro or Mavic Pro, I had to pick another winner for this one. Of course, what other choice did I have except for the brilliant Parrot Bebop 2 Adventurer. Thanks to its Cockpitglasses, this birdie performs as a magnificent VR machine. It has a great range, low latency, and unparalleled image quality. Cockpitglasses themselves are made out of high-quality materials and are adjustable, meaning they fit on virtually all head types. So, with all that being said, if you are looking for the best VR drone flying experience straight out of the box, I’m happy to inform you Parrot Bebop 2 Adventurer is your number one choice. VR stands for Virtual Reality. Nowadays, it is a common abbreviation in the gaming community with the rise of VR devices such as Oculus Rift, Playstation VR, and HTC Vive. However, when it comes to drones, VR is used as a complementary technology for First Person View… AKA FPV. It basically allows you to see a live video feed straight from your drone’s camera, giving you the feeling of being inside its cockpit. Sounds pretty wicked… and looks even more so! What's the difference between WiFi and 5.8Ghz FPV? 5.8Ghz FPV relies on analog connection and delivers next to nothing latency and decent range. This is the obvious choice for professionals and hobbyists alike as it allows them to take full control over their drones with zero lag. However, the video transmission quality is not brilliant since we are talking about analog signal. Still, due to low latency, it’s still considered the best type of FPV for drone racing. WiFi FPV works over the 2.4Ghz digital connection. It doesn’t require any additional hardware which is the case with 5.8Ghz FPV (you’ll need a proper 5.8Ghz receiver). That’s because most (if not all) smartphones and tablets these days can connect to WiFi and benefit from WiFi FPV. It’s cheaper to manufacture than 5.8Ghz which is the reason for it being the most popular FPV type for entry-level drones. How to connect a drone to a VR headset? In most cases, your WiFi VR headset won’t have its own display. Instead, you will have to slide your smartphone inside the “VR box” to initialize VR experience. Beforehand, you have to download an app and connect to your drone’s WiFi network. Once you get all that settle out, you will be good to go. Keep in mind that there’s a thing called 5Ghz WiFi. It only works with newer phones. The process of connecting 5.8Ghz VR headset to a drone is completely different. For instance, you won’t have to use your smartphone as these headsets come with their own displays. Furthermore, you will have to switch them to a certain channel to correspond with your camera’s transmitter. Newer models have an auto search option which makes this task a lot easier. Tips for flying with VR headset? Don’t go all in without thoroughly examining the area around you. Look out for any electrical cables, thin branches and other objects that could pose a threat. This one goes without question – make sure there are no people nearby when thinking of flying in VR. Better yet, have a friend/colleague stay beside you and monitor the area for passersby. If you are planning on flying at an attractive location, then there is one thing you must not forget – charging. It’s not enough to charge all of your drone’s batteries. You also need to keep your VR headset’s juice charged up if you want to fly in virtual reality. Needless to say, having headless mode turned one while driving in VR is a bad idea. Your controls will be all messed up, preventing you from making a proper turn. So, keep it off if you hold your drone precious. In the end, I would just like to thank you for taking your time and reading through this entire article. VR headsets are still a relatively new territory and haven’t been adopted by the masses. Thus leaving them behind on the new technological feats that surround them. However, I believe you’ll have a pretty solid knowledge after reading through the FAQ list. It explains all questions you might have before purchasing your first VR-enabled drone.